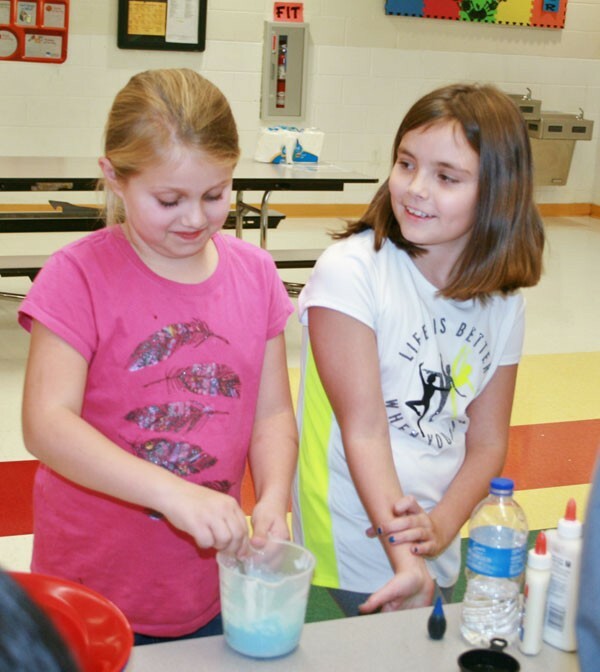 Adair County Elementary School students and their families turned out in big numbers Thursday evening, Nov. 17, 2016 for STEM (science, technology, engineering, and math) Night, the school’s celebration of empirical learning. In addition to the science fair, which was set up in the school cafeteria, other rooms were converted into makeshift experimental labs, allowing students to learn about sound waves, computer coding, physics, percentages and probabilities, drones, the water cycle, and much more. One of the more popular and entertaining exercises, aiming to teach students about weight distribution, allowed students to stand on open cartons of eggs without crushing them. Only a few messy mishaps were observed. The event was presented by the Adair County Family Resource Center, Title I, and the ACES Science Dept. Lauren Grant and Tristan Burton made the slimy compound Gak for their science fair entry Thursday evening at Adair County Elementary School’s STEM Night.